Time to get tight for Mr. Right with custom sweating for the wedding gear! Use the coupon code below to save! Use coupon code BPTV30 at checkout and get $3.00 off orders of $30.00 or more! Offer expires 2/28/2015 at 11:59PM EST. The the sweats and treats that come with the holidays are long gone and it’s time to start thinking about getting tight for Mr. Right. Every bride wants to look her best on our her wedding day and chances are she will develop a workout routine to achieve the look she is going for. Working out can be tedious and let’s be honest, not the funniest thing you could be doing. 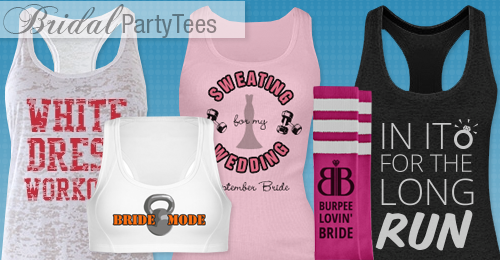 So why not be excited and get in shape with a custom bride workout shirt! Bridal Party Tees has a gallery of great motivational designs that will get you sweating for the wedding in no time. We offer a variety of performance wear that are breathable and have moisture wicking properties that will keep you dry during your workout. You can either start a design from scratch or choose one from our gallery and custom it with your wedding colors, dates, and names! 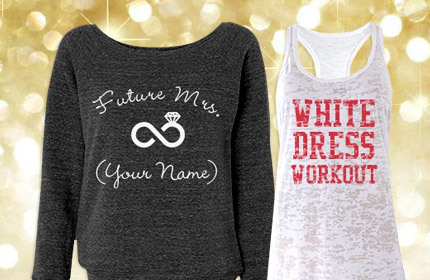 Do you have great ideas for custom bridal workout apparel? Take your ideas and create your own bridal apparel storefront! Getting engaged is an exciting time in your life and every moment should be cherished. With December being the most popular month for couples to get engaged there’s a chance someone you know popped the question or had the question popped to them this holiday season. 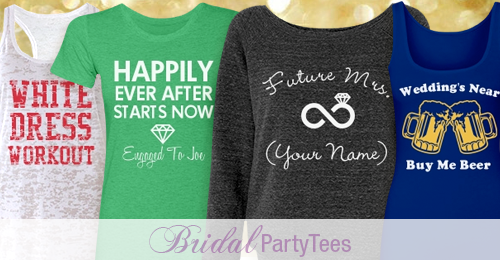 Help the newly engaged couple enjoy their moment by customizing a just engaged shirt or sweater with the future mrs. new last name. 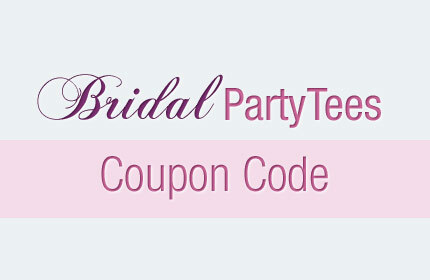 Bridal Party Tees offers an assortment of designs that include future mrs. shirts, off the market shirts, and soon to be shirts that are easy to customize. The user can simply add dates, names, switch out colors, art and fonts. There’s no better way than to show off and announce your engagement than with a custom just engaged shirt. Maybe rocking his last name isn’t your thing and your wedding style is a little more subtle. Check out our sweating for the wedding shirts that you can wear while getting your white dress workout on! Did you get engaged over the holiday season? Celebrate with a custom just engaged shirt or sweater! Use the coupon code below to save! Use coupon code BPTJ15 at checkout and get 5% off orders of $25.00 or more! Offer expires 1/31/2015 at 11:59PM EST.